A critical examination of the four decades–long failed U.S. policy of using military force to solve the ongoing crises in the Middle East. 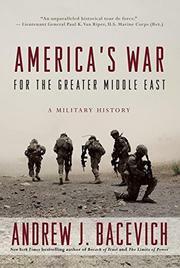 From the disastrous attempt to rescue the U.S. embassy hostages in Tehran in 1980 to the present day, Army veteran and author Bacevich (Emeritus, International Relations and History/Boston Univ. ; Breach of Trust: How Americans Failed Their Soldiers and Their Country, 2014, etc.) finds few accomplishments in the U.S. military action in the Middle East. The irony that the most peaceable, guileless president, Jimmy Carter, was the one to implement the first direct military action in the region (“An attempt by any outside force to gain control of the Persian Gulf region will be regarded as an assault on the vital interests of the United States”) underscores what the author sees as a long-running lack of clarity and focus to American policy. Thus, the Persian Gulf—specifically, the access to its oil—assumed new importance to the United States, and the region became a significant “area of responsibility” to be governed by the newly christened U.S. Central Command. Following a truly eye-opening diagram at the book’s beginning, which delineates the many staggered “selected campaigns and operations, 1980-” in the region by the U.S., Bacevich moves chronologically through these unfortunate military engagements—e.g., Operation Cyclone, the covert arming of the Afghan resistance to counter the Soviet invasion of Afghanistan. This particular campaign, writes the author, deserves mention for two reasons: it laid the foundation for the later overt actions, and it illustrates the persistent pattern of “intently focusing on solving one problem, to exacerbate a second and plant the seeds of a third.” Over and over, the U.S. military mentality of “we won, they lost” proved short-lived and misguided.